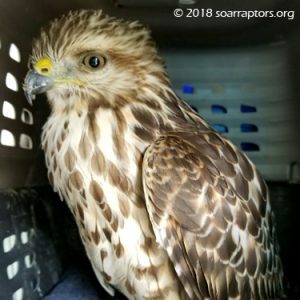 This is the time of year when SOAR gets hatch-year 2018 raptors admitted that are underweight and struggling. This hawk did collide with a vehicle and the driver is the one who reported this incident to Iowa Bird Rehab (Jenni). This hawk is also emaciated, not sure what happened with this hawk for it to get so thin… but that happened before the collision. Red-shouldered hawks are an Iowa endangered species even though in much of this bird’s range the population is growing. Visit All About Birds to learn and see differences between a red-shouldered and a red-tailed hawk. This hawk is still very thin and still needs to be hand-fed.